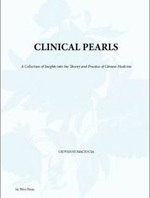 Clinical Pearls is a collection of Giovanni Maciocia’s insights and experience accumulated over 39 years. It discusses in detail and depth, among others, the treatment of autoimmune diseases, diagnosis and treatment of Heat, the functions, pathology and treatment of the Triple Burner and the functions and pathology of the Shen and Hun. In particular, the chapter on the Shen draws essential connections between the Chinese medicine view of the Shen and the Confucian philosophy.